Aids to Navigation can provide a boater with information similar to that which drivers get from street signs, stop signals, road barriers, detours, and traffic lights. 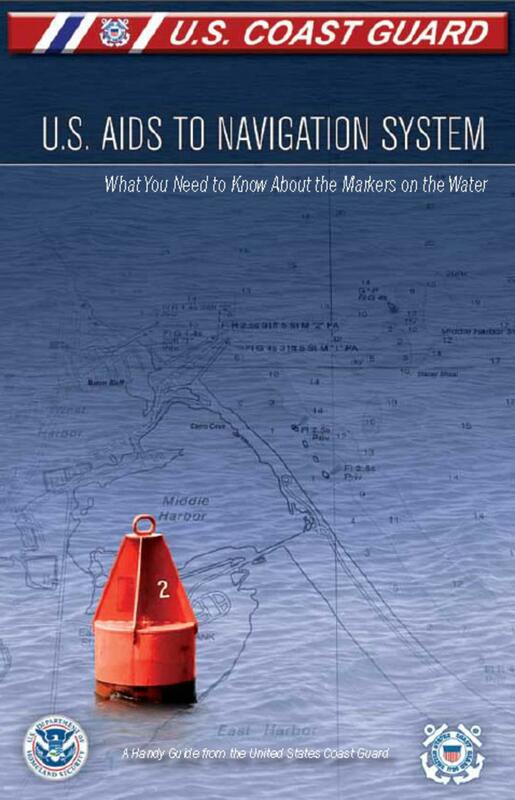 This booklet will give you, the recreational boater, the basic information you need about the U.S. Aids to Navigation System (USATONS). This information will help you recognize, understand, and navigate by the colors, shapes, numbers, and lights you will encounter on the water. It will also give you the basic tools you need to read a nautical chart. In addition, you will find information on safety, the proper way to interact with other vessels, tips on boating at night, and how to handle special situations you might encounter, like bridges and locks. Take some time to review this booklet, and keep it onboard your boat as a quick reference. Your understanding of the markers you see on the water will help ensure that you, your family, and your friends have fun – and safe – boating trips. Provided by the United States Coast Guard Boating Safety Division. Follow this link to read this extremely helpful and visual information on Aids to Navigation.